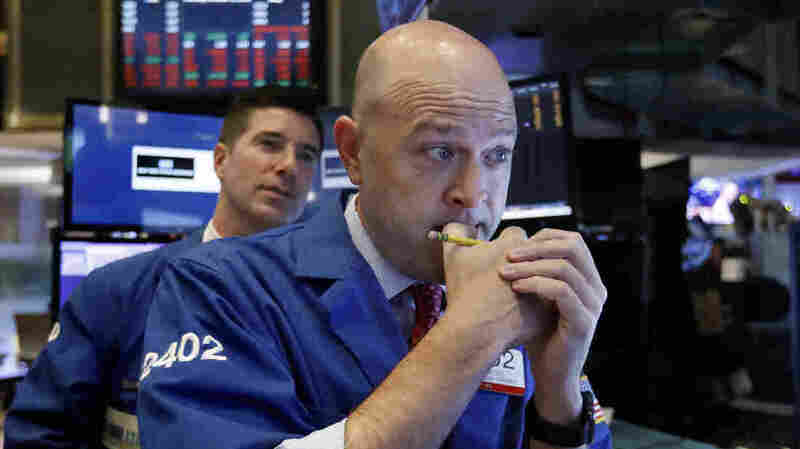 U.S. Stocks Down Sharply Again After Wednesday's Rout U.S. stocks indexes headed lower again after a global sell-off overnight triggered by a plunge in U.S. stocks the day before. Specialists Jay Woods (right) and Thomas McArdle work on the floor of the New York Stock Exchange on Thursday. The market's recent decline was set off by a sharp drop in bond prices and a corresponding increase in yields last week and early this week. After the huge sell-off Wednesday, U.S. stocks fell sharply again Thursday. At one point, the Dow was down nearly 700 points. By late afternoon, it had regained some ground but closed down 546 points or a little more than 2 percent. Over the past two days, the Dow has lost 1,378 points. The S&P 500 was down 2 percent for the day. The Nasdaq lost 1.25 percent. Investors remain worried that trade tensions between the U.S. and China as well as rising interest rates will slow economic growth. The Federal Reserve has been gradually increasing interest rates to less stimulative levels in response to strong growth in the U.S. economy and historically low unemployment levels. Investors worry the Fed might now raise rates faster to head off increases in inflation that could come from higher wages. But a government inflation report released Thursday showed consumer prices rose a bit less than expected in September. The core consumer price index was up just 0.1 percent. Mickey Levy of Berenberg Capital Markets says, "Despite the market's apparent concerns about an imminent acceleration in inflation, recent producer, consumer and import price data all point to moderating inflationary pressures after an acceleration earlier this year." On the trade front, White House economic adviser Larry Kudlow told CNBC during a morning interview that no new negotiations have been set with China to reduce tensions between the world's two largest economies. But later in the day came reports that President Trump would meet with the Chinese leader Xi Jinping in late November at the Group of 20 leaders summit in Buenos Aires, Argentina. Investors worry the tariffs imposed in the trade dispute could boost inflation, slow global growth and reduce company profits, all negatives for stocks. Tech stocks have been the biggest losers in the recent sell-off. On Wednesday, Netflix was down more than 8 percent, Amazon was off 6 percent, and Apple and Google were both down more than 4.5 percent. But many tech stocks are falling from record highs. For instance, Netflix remains up nearly 70 percent for the year, despite the recent decline. Overnight, Chinese stocks fell 5 percent while South Korean and Japanese stocks lost around 4 percent. European indexes shed a little less than 2 percent.